The Holy Fathers Russian Orthodox Church of the Seven Ecumenical Councils was the first parish established by Archbishop Appolinary (Koshevoi) of blessed memory, after the tragic separation of Metropolitan Platon from the canonical Russian Orthodox Church outside of Russia. 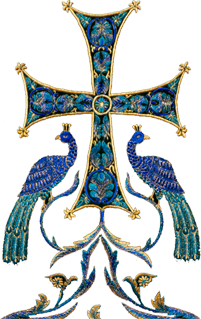 The "Holy Fathers Church," as it has been known, was established on February 12th 1928, and became the first of many parishes remaining faithful to the Russian Orthodox Church outside of Russia and her canonical hierarch Archbishop Appolinary. Originally housed in Manhattan on Fifth Avenue, between 128th and 129th Streets, the parish moved to a street level dwelling on West 153rd street in the late 1930's after the repose of Archbishop Appolinary. In the years that followed the parish grew and became a spiritual and cultural harbor for hundreds of Russian immigrants arriving from both Europe and the Far East, and settling on New York's upper west side. Through the diligent efforts of her long time pastor, Protopriest Alexander Krasnoymov, funds were collected for a permanent site. 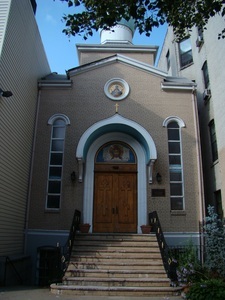 The current stone church was then erected one block further east on 153rd Street, led by Protopriest Sergay Kargay and Church Warden Michael Goncharov. A rectory was also acquired, and a school established for Russian Orthodox children. 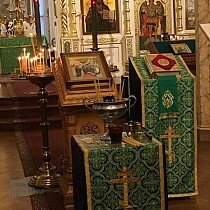 Although the Holy Fathers Church is not a large parish, it remains a spiritual oasis for all Orthodox Christians. The Holy Fathers Church is honored to be the home of the first copy, brought from Kiev, of the wondrous miracle-working Icon of the Mother of God of Pochaev. In its humility, the Holy Fathers Church remains faithful to the teachings of the Holy Orthodox Church and the Seven Ecumenical Councils and the canonical traditions of the Russian Orthodox Church Abroad.